A decline in the number of hospital beds is putting the NHS in England under increasing pressure and has become an important contributory factor in the number of patient deaths, according to one of the country's leading health statisticians. An investigation by Professor Sir Brian Jarman shows that average occupancy levels for hospitals in England have climbed to more than 89 per cent and have not gone below the government's recommended average of 85 per cent since 2002. Meanwhile, the number of beds has more than halved over the last three decades. In 1987 to 1988, there were 297,364 beds in England NHS hospitals; the figure now stands at 130,404. However, hospitals have treated many more people than they did back in the late 1980's - admissions have nearly doubled to more than 16 million. 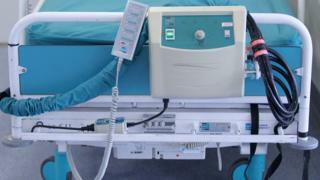 Sir Brian says the declining number of beds has put more pressure on hospitals in England. He said that doctor shortages had proved important contributory factors in hospital death rates but high occupancy rates were becoming increasingly prominent. He said: "The factor that is most important in being most strongly associated with the variation of the death rates in hospitals in England, is that the more doctors per bed - that's either junior doctors, senior doctors or total doctors per bed - is associated with a lower adjusted death rate in hospital." Sir Brian added that occupancy was beginning to come in the variables explaining the variation of death rates in hospitals in England. Pioneering statistical work by Sir Brian on hospital mortality rates proved key in exposing appalling standards of care by the NHS in mid-Staffordshire. The scandal was the subject of a public inquiry led by Sir Robert Francis QC. His damning report in February 2013 made a series of recommendations to improve patient care and encourage whistleblowers in the NHS. David Bowles, a former NHS Trust chief executive in Lincolnshire is leading a campaign to alert people to risks posed by high occupancy rates. He claims thousands of patients may have had their rights to safe care jeopardised by hospitals that fail to admit when they are struggling to cope with demand. Mr Bowles told the BBC that unless patients understood their rights they would suffer. He said: "The patient needs to understand and be given a proper description of the risks of a hospital. "If a hospital is seriously over full, you are less likely to get an intensive care bed when you need it; you are less likely to go into coronary care if you need it; you are less likely to have access to diagnostic services when you need it. You may go into the wrong kind of ward for your condition which means your complications are less likely to be picked up or you're more likely to get hospital-acquired infections. Those risks need to be explained to patients." I spoke to Alan Burt and his wife Delia from the village of Horbling in Lincolnshire about their experiences in March 2012 at their local hospital, Pilgrim Hospital in Boston. Alan was admitted to the accident and emergency unit after suffering a cardiac arrest. Delia says he had been resuscitated by paramedics but A&E doctors concluded he would not make a recovery and decided to place him in a side room and left him to die. She added: "If they'd just listened to what I was telling them they'd have known that he wasn't a poor old man that was right at the end of his life and this was his last illness, but nobody would listen. They didn't want to know. As far as they were concerned they'd made up their minds and really they were making the circumstances fit the theory and he was just abandoned. "And but for the interference of that wonderful nurse practitioner, he would be dead. If she'd been on holiday, which she was the very next week, if her holiday had been a week earlier, Alan would be dead because nobody else would've done anything." The Trust responsible for the hospital, the United Lincolnshire Hospitals referred to a health ombudsman's inquiry into the case which had found there were 'no issues' in relation to Mr Burt's clinical care. A spokeswoman added: "However, we do acknowledge we were slow in responding to Mr Burt's complaint, and we would like to apologise for this and any anxiety or frustration that this caused. "In 2013 we introduced a new complaints system at ULHT. Ex-complainants were involved in designing the complaints process and staff workshops were held exploring their involvement with, and handling of, complaints and we have managed to significantly increase the number of complainants satisfied with the response." A spokeswoman for the Department of Health acknowledged the NHS was busier than ever but said hospitals were coping well with increased demand. She added the government was committed to delivering a safer seven-day health service and investing £10bn to fund the NHS's own plan to transform services in the future.